Vegan parmesan cheese? Is it possible? Is it available? And more important, is it tasty? The answer to all three is yes! From Eat in the Raw comes parma! 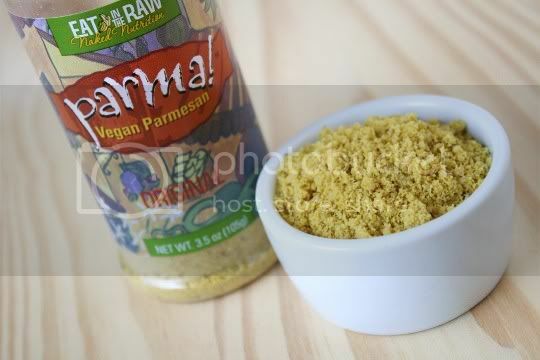 Vegan Parmesan, a nutritional yeast-based alternative to the nutty, salty, and flavorful cheese that adds that special zip to many Italian dishes. But this is more than just nutritional yeast (aka "nooch"). For starters, parma! is made with the Red Star variety that contains a high amount of Vitamin B12. It's also made with organic ground walnuts and Celtic sea salt. 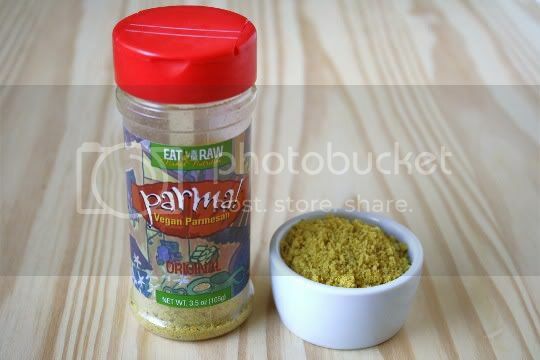 So you may be thinking, "Well it's just seasoned nutritional yeast!" And yes, that's exactly what it is...but the taste is so amazing. It has the same savory, earthy, cheesy flavor of nooch, so if you're already a fan of that, you'll love this. It's perfectly salted, giving it a natural parmesan-like flavor. The addition of walnuts give it a crumbly texture, instead of the flakiness of nooch alone, as well as a nice nuttiness that goes well with whatever you put parma! on. You can probably experiment with making your own version of this, but using parma! (with its fun, colorful packaging) is just so fun! Let's take a nice hunk of garlic bread, for example. I spread a piece of sourdough loaf with Earth Balance, then sprinkled it liberally with garlic powder, Italian seasoning, and the parma!. 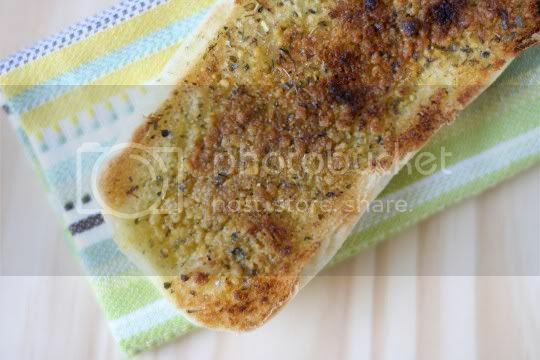 After broiling for only a few minutes, I was in garlic bread heaven! There's something about adding parma! to a creamy ingredient (like the Earth Balance) that imitates a softer, melty version of Parmesan, which is a great thing if you're looking to make some "cheese" sauces. While this doesn't taste EXACTLY like regular Parmesan cheese, it's a surprisingly similar substitute. You'll get the same salty, earthy flavor to add to pasta, bread, pizza, vegetables, and whatever else your heart desires. And try it for cheese sauces too! Buy again? Definitely. I may never need (or miss) real Parmesan again. Also available in Chipotle Cayenne flavor...mmmmm.